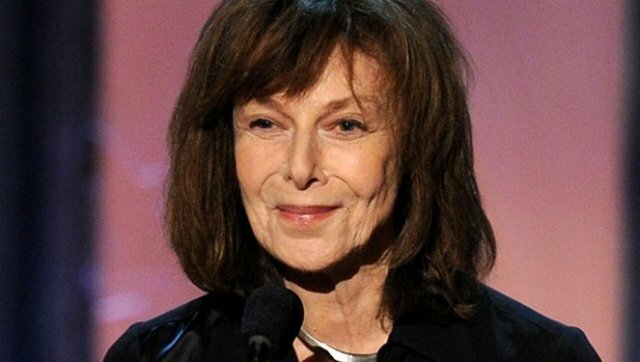 Elaine May making a rare Broadway appearance. Gladys Green is an elderly woman who runs a small art gallery on Waverly Place in New York City. A former lawyer, she started the gallery years so; it hasn’t had much success but it gives her a place to go each day from her apartment upstairs in the building. Her grandson, Daniel lives in another apartment. But Gladys is exhibiting disturbing symptoms. Her short-term memory is failing, she repeats herself endlessly, and focuses on past events. Her hearing has also deteriorated and she keeps turning down or off her hearing aids. 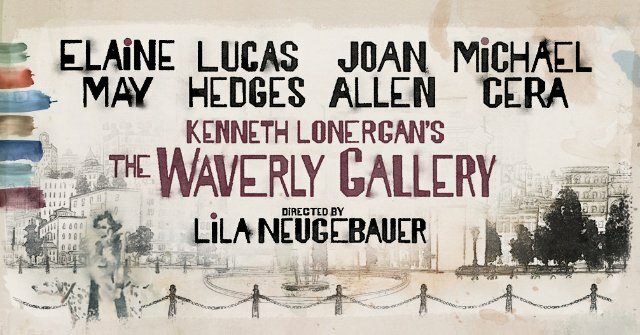 In Kenneth Lonergan’s The Waverly Gallery, Gladys is the center of the story as her grandson, her daughter and son-in-law and a young artist she has befriended deal with this decline over a two year period. As played by Elaine May she is making a rare stage appearance. Gladys at first seems competent with a few minor lapses that are perhaps caused by her hearing loss. She keeps thinking her grandson is a reporter (sometimes it is for The New York Times), but she remembers many details about her physician husband, her daughter (Ellen) also a physician and even that she and her husband had put Ellen’s first husband and Daniel’s father through medical school. Early in the play, Don Bowman, stops in the gallery. He’s an aspiring artist from Massachusetts who has come to the big city to try to achieve his dream. Don offers to show Gladys some paintings and when she learns he has no place to stay, invites him to stay in a small room at the back of the gallery. As time goes by, Daniel, Ellen and her second husband, Mark must consider the options. Can Gladys stay in the gallery? What if the hotel next door who owns that space wants it? Ellen and Gladys have not had the best mother-daughter relationship, so the thought of moving her into Ellen’s house terrifies Ellen. During the two years of the play, in multiple scenes set in the gallery and Ellen’s dining room, we see problems worsen and tensions increase. Like so many middle-aged people, Ellen is becoming her mother’s parent. For Daniel, he is shouldering more of the burden since he lives near Gladys. As she worsens, she takes to knocking on his door at all hours of the night. Don becomes almost a part of the family but his emotional distance provides insulation. He refuses to realize what is actually happening and instead keeps insisting that she needs better hearing aids. You are never sure when it dawns on him that hearing is not the main problem. Elaine May gives a touching performance as Gladys. She seems oblivious to problems, and yet you sense that underneath it all, she is aware. Her interactions with her grandson are tender and real. She is surrounded by an excellent cast. Lucas Hedges who is making his Broadway debut, is outstanding as Daniel. He is caring, concerned and, at times, exasperated. It has been said, that the play is based on Lonergan’s friend, Matthew Broderick’s experience with his grandmother. Joan Allen is excellent as Ellen. This over-worked and over-achieving professional is concerned about her mother; but just doesn’t want her to live with them. It would “drive her nuts.” She also understands how much of the burden her son is shouldering. David Cromer has her husband, Mark has a less developed role. He seems mainly to be a bystander of the family drama. Michael Cera is the somewhat naive Don. The play has a few laughs and some in the audience may find these uncomfortable. Are we laughing at Gladys’ mental deterioration and mistakes? Are we laughing out of fear that we may become her someday? The situation isn’t funny, so the laughter makes us question our own empathy. Yet, if we can’t laugh at the absurdity of life, how do we get through it? Director Lila Neugebauer has done a fine job at keeping the balance between the tragedy of a deteriorating mind and the ridiculousness of it all. Scenic designer David Zinn has created the gallery, Ellen’s apartment and the upstairs. His set is aided by fine projections of Tal Yarden, and lighting (Brian MacDevitt) and sound (Leon Rothenberg) designs. As the play ends, Daniel tells us about what happened after Gladys moves into Ellen’s apartment. The Waverly Gallery is at the Golden Theatre, 252 W. 45th Street though January 27. For tickets, contact Telecharge.